The Professional’s Ultimate Carpet Cleaning Package. 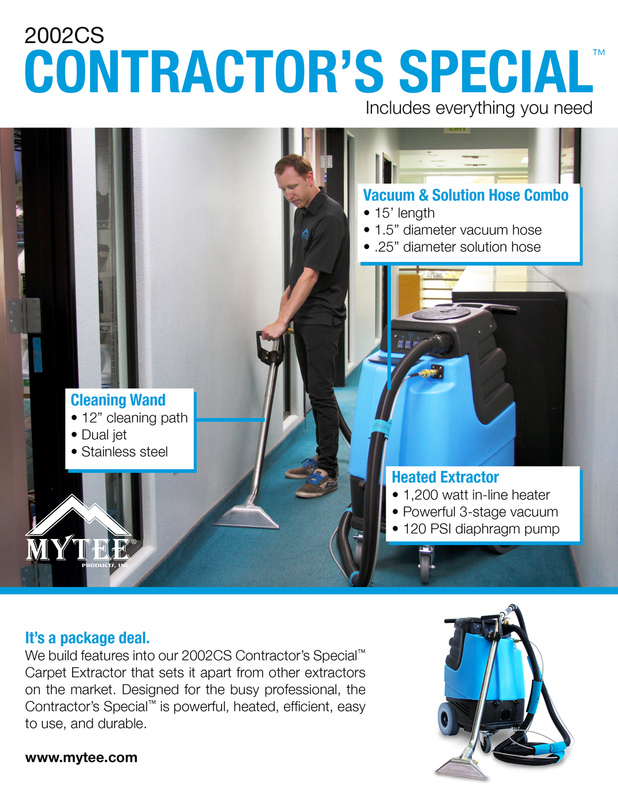 Mytee’s 2002CS Contractor’s Special Package has everything you need in a carpet cleaning package to get started as a professional carpet cleaner. It includes our popular heated carpet extractor, a 15′ vacuum and solution hose combo, and a 12″ dual jet stainless steel wand. Our 2002CS Contractor’s Special Carpet Extractor has features that set it apart from other carpet extractors on the market, like being able to run on only one power cord. This makes it much easier for you to find an adequate power source for your machine. Designed for the busy professional, the 2002CS is powerful, heated, efficient, user-friendly, and durable. So get the package that gives you everything you need to take on the toughest carpet and upholstery cleaning jobs. Order the 2002CS Contractor’s Special™ today!